Promote Your Business Through the Chamber! 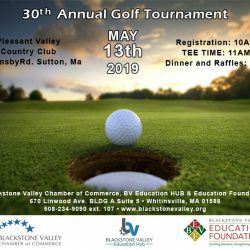 The Blackstone Valley Chamber of Commerce offers effective and affordable ways for you to market your business. Join us at some of our monthly and yearly events and we’ll help you network your business and put your message in front of the hundreds in attendance. Your company name and logo displayed on our invitation mailed to Chamber members. $150 Annual (includes lunch & program) – Opportunity to showcase your business at a 6 foot table during all six Women’s Business Network Luncheon event. $15 per event (does not include luncheon program – ) Opportunity to showcase your business at a 6 foot table during Women’s Business Network Luncheon event. Annual Company Ad on chamber website which receives over 18,000 unique visitors and 9 million pageviews. Single Booth Space at preferred location. Company Name & Logo on media advertising; newsprint and radio. Company name and Logo on Best in the Valley Chili Banner & signs. Company name and Logo on Entertainment Banner & signs. Company name and Logo on Seminar banner and signs. Sponsor a booth for your favorite 501C3 organization by purchasing a booth for them and purchase a single booth for your company for only $350! Player registration includes breakfast, driving range, lunch, soft drinks, photos, greens fees, cart, gifts, awards and more. 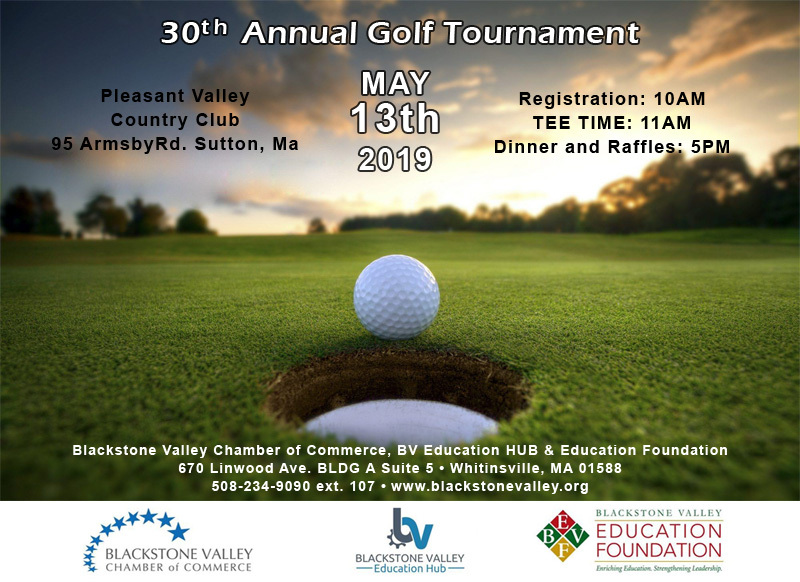 The Blackstone Valley Education Foundation is a 501 C 3 charitable organization. 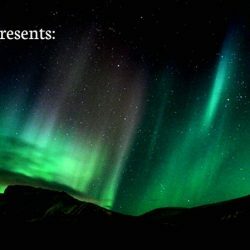 A portion of your sponsorship is tax deductible. Your company will be recognized as the “Presenting Sponsor” of the BVCC Annual Meeting and Awards Ceremony on all materials. Includes (2) reserved tables of (10) in center front row for your guests and (2) seats at the Special Guest’s table. The Presenting Sponsor’s spokesperson will be introduced and will have the opportunity to formally introduce the Lt. Governor to the assembly. Your company will be recognized as a “Supporting Sponsor” and listed on entrance banner and programs. Includes (1) reserved table of ten (10) with preferred center front room location. Supporting Sponsor locations will be allotted on a first-come first-serve basis. Your company will be listed as a “Chamber Supporter” on the programs. Includes (1) reserved table of ten (10) with preferred locations set behind Supporting Sponsors. Locations will be allotted on a first-come first-serve basis. Your company’s name and logo listed on program as “Wake Up Coffee Sponsor” Company logo sign displayed on the draped coffee table. Four (4) admissions to Annual meeting. Opportunity to display your promotional information and distribute your business cards while serving that “first morning cup” of coffee to over 100 of our Chamber members. Sponsor on Chamber website and in Chamber e-blasts. Acknowledgement in all press releases and by Chamber MC at the Annual Meeting. The opportunity to showcase your business on a 6 foot skirted table at the event Company signage complete with name and logo on table. Two (2) Admissions to Annual Meeting. Opportunity to Sponsor a door prize attracts attendees to your table and gives you additional promotional exposure. Your company name displayed prominently as a Business Showcase Sponsor on Chamber website and in Chamber e-blasts. Acknowledgement by Chamber MC at the Annual Meeting.